Kilcoo set up an Ulster club semi-final clash with Crossmaglen by hammering Kingscourt at Breffni Park. Kilcoo powered clear of their Cavan hosts after the break with Jerome Johnston netting before Paul Greenan fired in a third goal. 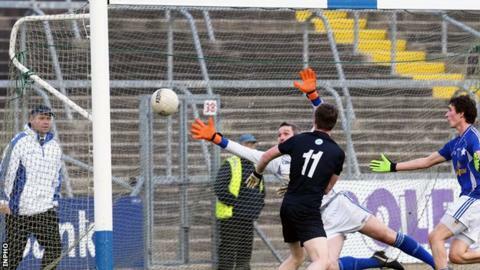 An out-classed Kingscourt had Padraig Faulkner sent-off in the second half. Conor Laverty chipped in with five points in a superb Kilcoo display. The semi-final showdown against Cross promises to be a titanic tussle with the teams having met in feisty and often controversial encounters. Cross beat Kilcoo in the 2012 Ulster decider while the Down men prevailed in a quarter-final replay a year later. Kilcoo manager Paul McIver: "I'm delighted - the boys played really well, especially once we got a grip on the game. "I've an unbelievable bunch of players, who always strive to be the best. They are born leaders. "It should be a great game against Cross and we know it will be an enormous task. "But the previous meetings are history and mean nothing. This is a new era, a new manager and with many new players."